With its refined direction of reaching out to the “modern urban progressive adults” this year, ntv7 carefully selects content that is relevant to its target audience. Viewers can expect a continuous solid line-up of programmes to be shown in its successful weekday primetime slot from 9.30pm – 10.30pm including strong titles like “Super Hero at Home” and “The Undercover” that is currently airing every Monday to Thursday. 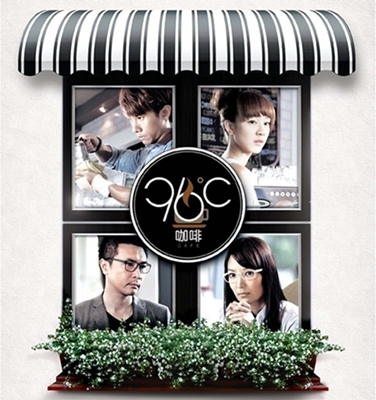 Come 26th August 2013, the Home of Feel Good will showcase a brand new Singaporean drama series entitled “96°C Café” with a brilliant mix of casts made up of Tay Ping Hui, Chris Tong, Desmond Tan, Julie Tan, Paige Chua, Ian Fan, Romeo Tan and Cynthia Koh. This series marks the 3rd collaboration between Singaporean heartthrob Tay Ping Hui and Malaysian sweetheart Chris Tong, who will be playing a couple in the show. From enemies to lovers, Tay and Tong’s love-hate relationship in this 20-episode series will definitely bring a new spark to their long time collaboration. The show revolves around the owner of a café, Li Qiao (Desmond Tan) and how he coped with his life after his wife met with an unfortunate road accident. Li Qiao is lucky enough to have a faithful employee by the name of Yu Chen (Julie Tan) who helps him unconditionally while he deals with the loss of his wife. The sunny Yu Chen continues working at 96°C Café, and starts to develop feelings for her boss Li Qiao. Yu Chen meets a rich man’s son Chuan Zhi (Ian Fang), who realises she has secret feelings for Li Qiao. Meanwhile, Li Qiao’s sister Ruo Lin (Chris Tong) who is about to marry her longtime boyfriend Bill, goes for a check-up and realises that she will not be able to have children. Fearing that Bill will call off the wedding, she brings forward the wedding under the excuse of wanting to fit into a pretty wedding dress. She intends to come clean after the wedding, and prepares for the ceremony tentatively. Bill’s best friend Jing Feng (Tay Ping Hui) then finds out about Ruo Lin’s plan, and wants her to confess the truth to her fiancé. Bill soon finds out about Ruo Lin’s deception and fails to show up on the wedding day, leaving Ruo Lin humiliated and alone. She pretends nothing is wrong and goes to work the next day, only to be mocked by her colleagues. Jing Feng arrives at that time, and pretends to be her suitor. As the story unfolds, Li Qiao gets injured because of Yu Chen, and gets amnesia. He has no recollection of his deceased wife, and thinks that Yu Chen is his girlfriend. Li Qiao’s grandmother begs Yu Chen to keep up with the story, in order to help Li Qiao move on. As time passes by, Yu Chen gets more adept at being Li Qiao’s girlfriend. It turns out that Li Qiao’s amnesia was feigned. Chuan Zhi stumbles upon Li Qiao when he was reminiscing about his deceased wife in the café, and is furious. He wants Li Qiao to confess in order not to hurt Yu Chen deeper. What will happen and what is the future of 96°C Café? Relevant and heartening, each episode reveals a lesson to be learned about the unplanned setbacks in life, while remembering the laughter and dreams that are often shared over a cup of coffee. Don’t forget to catch this amazing series from 26th August 2013 onwards, every Monday to Thursday, 9.30pm only on ntv7, the Home of Feel Good. For more information on the show, log on to www.ntv7.com.my and www.tonton.com.my, or follow the ntv7 Facebook and Twitter.